Leo Ahrendsen, 87, of Mechanicsville, formerly of Olin, passed away Saturday, June 10, 2017, at St. Luke’s Hospital in Cedar Rapids. 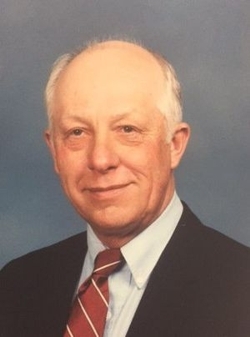 Visitation was held at Lahey Funeral Home in Olin on Wednesday, June 14, from 4 – 7 p.m. with a Masonic Service at 7:00 p.m. Funeral services were held at Olin Community Methodist Church on Thursday, June 15, 2017 at 11 a.m. with burial at Mayflower Cemetery in Oxford Junction. Leo was born on November 4, 1929, on the family farm in rural Clarence to Arthur and Mathilde (Carstensen) Ahrendsen. He graduated from Wyoming High School in 1947. Leo married Virginia Marie Foy on May 14, 1950, in Cedar Falls. Leo and Virginia farmed west of Wyoming until 1962. They then moved to Clarence and purchased the family farm which is now a century farm. They moved to Olin in 1984. Virginia died June 5, 1988. He married JoAnn (Thumma) Pearson on April 3, 1993. Leo was a member of the Olin Masonic Lodge #226. He served the Olin Historical Society and was on the board of Citizens State Bank for thirty-five years, as chairman for eighteen years. He served eighteen years on the Clarence Telephone Board and twelve years on the Olin School Board. Leo enjoyed playing cards, traveling, bowling, cattle buying trips, reading history and operating the combine. He was an avid Hawkeye and Cubs fan. Leo was a member of Olin Community Methodist Church where he held various leadership roles. Those left to cherish his memory are his wife, JoAnn; five children, Marcia (Warren) Nielsen f Bondurant, Kathy (Larry) Houstman of Tipton, Sandra (Rick) Less of Swisher, Lynn (Shelly) Ahrendsen of Clarence, and Alan (Michelle) Ahrendsen of Anamosa; ten grandchildren, Josh (Liz) Nielsen, Jacob (Carol) Nielsen, Aaryn (Chad) Bennett, Nathan Houstman, Kevin (Elizabeth) Houstman, Zach (Morgan) Less, Jace (Brittany) Ahrendsen, Becca Ahrendsen, Emelie Ahrendsen, and Jaden Meyer; seven great-grandchildren, William and Ruth Neilsen, Lydia and Camden Bennett, Ethan and Lucas Houstman, and Hudson Less; two expected great-grandchildren, three step-children, Cynthia (Larry) Platner, Dennis (Tracy) Pearson and Craig (Dorena Crock) Pearson; nine step-grandchildren, eleven step-great-grandchildren with two expected, and two brothers-in-law; Jim Foy and George Foy. He was preceded in death by his parents, wife, Virginia, sister, Janice, and brother, Lyle.